CropStop: Do You Have a Ticket? Time again for the CropStop embossing project. I used the Cuttlebug Pop Culture border set. But in a new way! 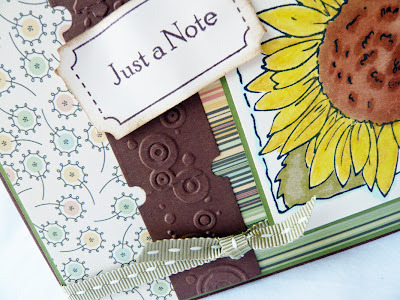 First I used the NEW Tim Holtz ticket die to cut a strip of tickets, then I embossed them with the border folder! I also cut an extra ticket from cream paper and stamped a ticket frame (Hero Arts) and a sentiment (KLM Designs) onto the ticket. 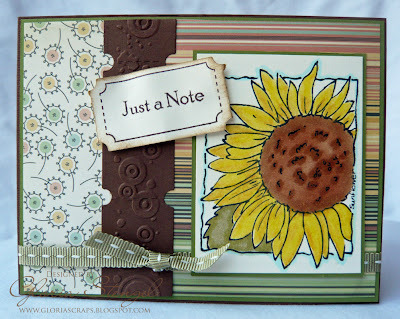 The paper is all Cosmo Cricket Earth Love (6x6 pad purchased at...yep...CropStop). That fantastic sunflower stamp is one of the NEW clear stamps from KLM Designs. I colored the image with Copics and pencils. Yum!